On September 25, 2018, at the Marriott Hotel in Warsaw, the Food Export Congress was organized by the company Fischer Trading Group Sp. z o.o., the publisher of ‘Food from Poland’ and ‘Wholesale & Retail’ magazines. 180 representatives of food sector producers, government institutions and producer organizations supporting export, as well as trade counsellors of foreign embassies participated in the event. In parallel with the thematic part during which over 30 speakers and panelists appeared, in a special ‘Business Meeting Room’ zone prearranged international trade meetings in B2B formula were held. 30 traders from foreign shopping chains from a dozen or so world countries participated in the business meetings with Polish producers of the food sector. Producers had a splendid opportunity during the conference to establish and refresh business contacts connected with export. The Congress was addressed to both those companies which satisfactorily carry out their export sales and those agri-food sector producers who intend to direct their trade offer to foreign customers. During thematic panels moderated by Wojciech Szeląg, a popular TV Polsat News journalist, experts discussed the issues of competitiveness of our economy, consumer and economic patriotism, promotion of Polish products. They talked about both difficult and easier foreign markets, especially the most promising ones, about the important role of organizations which support Polish companies in export, about combining forces of Polish producers on difficult foreign markets, about perspectives and hazards connected with foreign trade, about the business risk and ‚Polishness’ which is an asset of food products on foreign markets. The Food Export Congress is the first commercial event on the Polish market which allowed its participants to gain valuable knowledge on the food market, important export directions and perspectives of the foreign trade development. The grand opening of the Food Export Congress in Warsaw was conducted by Tomasz Pańczyk, President of the Management Board of Fischer Trading Group Sp. z o.o. – pointing during his speech to a very important role of food export and the presence of Polish products on the International arena. During presentations by experts opening the Congress, participants could hear about the perspectives of the development of Polish food export and Polish export hits discussed by Monika Tyska, Deputy General Director of the National Support Center for Agricultural. Igor Jeliński, Managing Director CEO, VIVE Group stressed how important, in business relations, is the communication and openness to other cultures, and how to manage the cultural differences in the building of effective relations in the export busines. Director in the team for brand strategy PwC – Marta Marczak shared her valuable knowledge on developing brands which are part of a given culture and reflect it, and mentioned the important value of Polish origin products on the food market. She also discussed a very interesting topic regarding sector strategies, strategies based on functional advantages and values. The Congress was addressed to both those companies which satisfactorily carry out their export sales and those agri-food sector producers who intend to direct their trade offer to foreign customers. The first discussion panel was connected with economic diplomacy and was participated by Cezariusz Kwaterski – Counsellor from the Minister of Foreign Affairs, Andrzej Szumowski – President of the Management Board of the Polish Vodka Association (PVA), Igor Jeliński, Managing Director CEO, VIVE Group and Robert Zawadzki, Deputy Director of the Department of Economic Promotion in the Polish Investment and Trade Agency. During the panel moderated by Wojciech Szeląg participants discussed among other things what should be done so that Polish food brands become more recognizable in the world and whether support forms currently given by the Polish diplomacy to the food sector producers abroad are sufficient. In the second panel, Polish food export development issues were discussed with the focus on opportunities and hazards. The panel participants were representatives of leading producer and trade organizations in Poland – Renata Juszkiewicz – President of the Polish Trade and Distribution Organization, Łukasz Dominiak – General Director of The National Poultry Council - Chamber of Commerce, Andrzej Gantner – General Director of the Polish Federation of Food Producers, Wiesław Różański – President of the Union of Producers and Employers of the Meat Industry (UPEMI) and Arkadiusz Gaik - President of the Association of Polish Distributors of Fruit and Vegetables ‘Unia Owocowa’. Panelists made an assessment of the situation of the Polish food export from the point of view of the branch organization, and set the direction of export development in the individual branches. Also touched were issues connected with protectionism in trade with the European Union countries, trade blockades, safety in production or quality systems. Another discussion panel was connected with the topic of promotion and support of Polish food export worldwide. This very important subject for producers was discussed by Monika Tyska, Deputy General Director of the National Support Center for Agriculture, Robert Zawadzki, Deputy Director of the Department of Economic Promotion in the Polish Investment and Trade Agency and Małgorzata Ryttel, President of the Management Board of Maxpol Sp. z o.o. a company which organizes foreign trade fairs. During the discussion participants wondered whether food can become an icon of Polish export and they pondered over possibilities of even more effective promotion of Polish agri-food export abroad. The panelists also informed the Congress participants on what support of the government institutions Polish exporters of the food sector can count on. The fourth expert panel was connected with the subject of means and possibilities of protecting against the risks in food export. The panel participants included Janusz Władyczak, President of the Management Board of Export Credit Insurance Corporation (KUKE), Rafał Szczotka, Director in a tax team of M&A, PwC Poland, Szymon Wiliński, Director of Economic Information Development, Coface and Radosław Jarema, Managing Director of the Polish Division of the Payment Institution AKCENTA. The invited guests raised legal and tax issues connected with running business abroad, forms of safeguarding payments on the international market, and possibilities and forms of minimizing the financial risks linked with the export activity. For another two panels we invited representatives of Polish production companies which are successfully carrying out export sales all over the world. And these included: Grzegorz Lenart, Export Director of LOTTE Wedel Sp. z o.o., Krzysztof Koszela, Member of the Management Board, Export and Foreign Markets Development Director, Colian Sp. z o.o., Norbert Gałuszewski, Export Director of ‘Herbapol – Lublin’ S.A., Andrzej Pieczonka, Export Development Manager from the company Instanta Sp. z o.o., Edward Bajko, President of the Management Board of the Dairy Cooperative Spomlek, Jacek Lewicki, Business Development Director from the Regional Dairy Cooperative in Piątnica, Jerzy Wasilewski, Managing Director from the company Indykpol S.A. and Ewa Pruska, Foreign Trade Office Director Konspol Holding. The Congress participants could use the knowledge and experience of the panelists, who talked about what mistakes should be avoided during export contacts and how to use the abilities connected with the development of export on different world markets. A stormy debate was conducted on whether the Russian embargo actually gave Polish producers an impulse to search for new sales markets and whether the Polish food branch actually is innovative and competitive on the world markets. Another conference element was the presentation of a very prospective market for Polish export – i.e. China. Michał Bielewicz, the owner of the company ForCap Co.Ltd., Michael Guo, President of Beske (Shanghai) Co. Ltd and Eva Chen from the Purchasing Department, Pinlive (Shanghai) Foods Co. Ltd., talked about possibilities and ways of entering this important market, the necessity to register goods and forms of promotion. The seventh and the last discussion panel was devoted to a very important issue – i.e. Brexit. The panel participants - Wiktor Sawosz, President of the Manageemnt Board of Brand Distribution, Radosław Jarema, Managing Director of the Polish Division of the Payment Institution AKCENTA, Tomasz Barańczyk, Partner, PwC, and Beata Rybicka-Dominiak from the National Board of Poultry Processing – discussed the scenarios of Great Britain leaving the European Union and the influence of Brexit on the export of Polish products to the UK. Views were divided – for part of the panel participants Brexit will have a positive influence inter alia on the improvement of the quality of export products sent to the UK, but according to others Brexit will pose a serious hazard for companies which have mainly focused their export activity on Great Britain. During the ‘Food from Poland’ evening Gala we presented over 50 awards of ‘Polish Food Export Awards’ and a title of ‘Ambassador of Polish Food Export’ – to the most important Polish companies successful in the export of food products and promoting Poland and Polish products on the international arena. Among laureates there were also government institutions and organizations supporting food export. 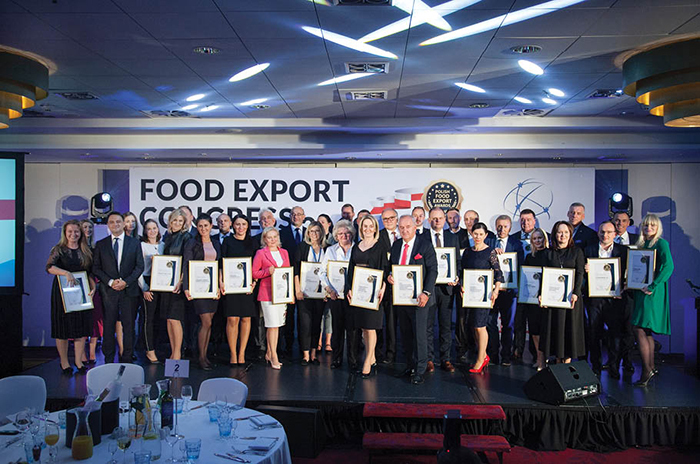 Among the laureates of ‘Polish Food Export Awards’ are: Mlekovita Group, Animex Foods, Maspex Group, Sokołów Group, Mokate Group, Dairy Cooperative ‘MLEKPOL’, FoodCare, Colian Group, Superdrob, Polmlek Group, Graal, Indykpol, Konspol Holding, Wawel, Instanta, Lotte Wedel, Tarczyński, Meat Plant Henryk Kania, Dairy Cooperative Spomlek, Mieszko, Meat Plant Łuków, Drosed, Herbapol – Lublin, Bakalland Group, Confectionery Production Plant Vobro, Candy Factory ‘Pszczółka’, Zbyszko Company, Confectionery Industry Plant Śnieżka, Regional Dairy Cooperative in Piątnica, Bifix, Dan Cake Polonia, Bogutti, Dobrowolscy, Sante, OSHEE Poland, Sertop, Virtu, Majami, Argo, Cedrob, Dega, Rolnik, Reydrob, Seko, Brand Distribution Group, PPH Maxpol, National Support Center for Agricultural, Polish Agency of Investment and Trade, The National Poultry Council - Chamber of Commerce, Union of Producers and Employers of the Meat Industry (UPEMI), Polish Vodka Association (PVA), Polish Federation of Food Producers – Union of Employers, Polish Meat Union. Polish Food Export Awards are presented for achievements in food export and promotion of Poland and Polish products in the global market. The Food Export Congress is the biggest commercial branch event in Poland gathering the biggest exporters of the agri-food sector, organizations, institutions and representatives of foreign distribution companies and shopping chains.